Jurgen, a Comedy of Justice (1919) by James Branch Cabell. 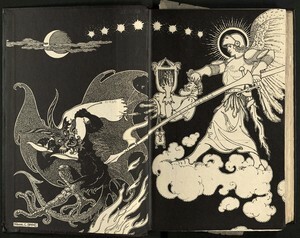 Endpaper illustration by Frank C. Pepé. The Virginia Commonwealth University Libraries invites applications and nominations for the position of Teaching and Learning Librarian. This position works in a collaborative environment in James Branch Cabell Library’s Special Collections and Archives department to provide instruction for a range of collections, primarily with artists’ books, rare books, and primary source materials. The Teaching and Learning Librarian also will take lead to expand and enhance the department’s instruction program and to oversee its dedicated instruction room. Review of applications will begin September 12, 2016 and will continue until the position is filled. More information about the position and its qualifications, the university, and the application process is available here.